Stable, functional and mobile: thanks to its generously sized platform and the robust railing, the seca 676 is ideal for diverse uses. 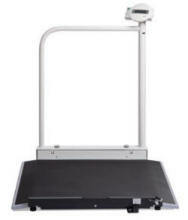 For example, patients can be weighed sitting in a wheelchair or on a chair. Frail patients or patients who have difficulty walking have the possibility of using the railing as support. When no longer in use, the seca 676 can be folded together in no time at all, thus saving storage space. The firm locking device between the railing and platform ensures that the scale stands safely also when folded together. When folded together, the railing serves as handle – making it effortless to move and store away the seca 676 on the smooth running transport castors. The pre-TARE function with storage space for three additional weights such as that of wheelchairs guarantee the simple and reliable ascertainment of the net weight.